When a resident applies for planning permission to Medway Council (the Planning Authority), on receipt they will send a copy of the application to the Parish Clerk. The Parish Council is a statutory consultee and has to be advised of all planning applications within the parish. The Clerk in turn will forward the application to a Parish Councillor who sits on High Halstow Parish Council’s Planning Committee. The Councillor will then contact the immediate neighbours (or anyone else they consider might be affected), offer them a sight of the application and plans and listen to any comments they might have. If the neighbour wishes to object they must do this themselves by writing to Medway Council. Planning applications are discussed at Parish Council meetings. In the event that the closing date for comments to Medway is before the next parish council meeting, the Clerk has delegated powers to respond to Medway, with the advice of the councillor handling the application; however if the application is contentious, a meeting of the Parish Council’s Planning Committee will be called. It must be noted that the Parish Council is merely a consultee. The responses sent to Medway have to be made on planning grounds, but at the end of the day the decisions are Medway’s and they may not necessarily agree with the wishes of the Parish Council. 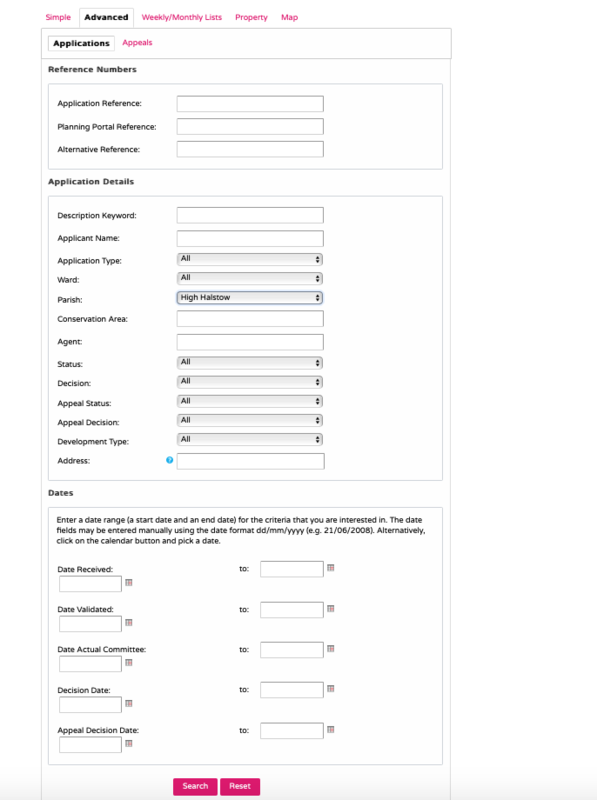 To assist for looking for high Halstow related applications the parameter to chose would be to click on the Parish Tab and select High Halstow as per below. You can then select other criteria such as date range, awaiting decision etc to narrow the search down to a reasonable level. Obviously you can use this to search on any number of parameters and for argument sake you could say look for applications effecting the Peninsula as a whole and therefore the parameter to chose would be to click on Ward and select Peninsula as per below.You can then again select other criteria such as date range, awaiting decision etc to narrow the search down to a reasonable level.